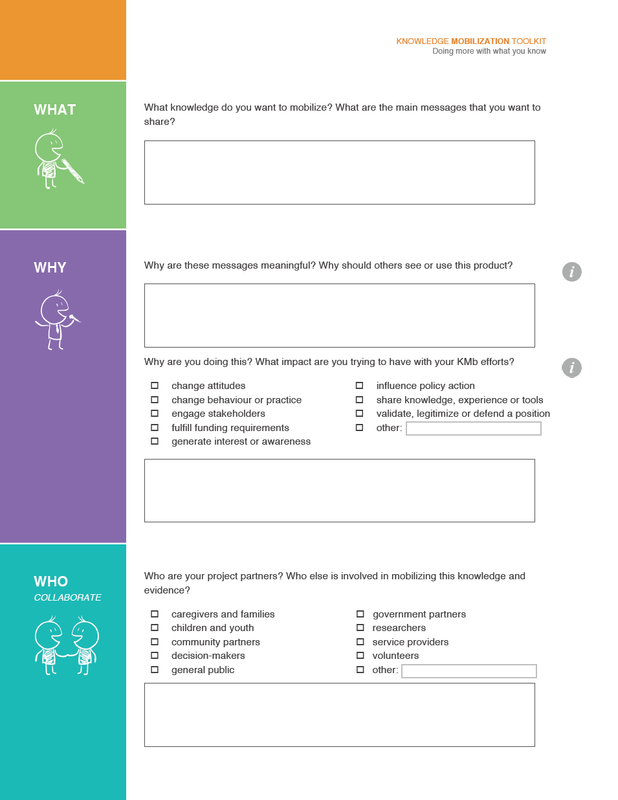 Looking for more information to help you plan your knowledge mobilization efforts? The Ontario Centre of Excellence for Child and Youth Mental Health offers a variety of resources that can help you plan for knowledge mobilization (KMb). Check out the Resource Hub for access to a variety of products, including the Grants and Awards index that summarizes the work of other agencies, such as how agencies looked at mobilizing program evaluation findings. The Hospital for Sick Children's Knowledge Translation Planning Template provides step-by-step guidance on developing a plan for research developers. A certificate training program is also available. The Mental Health Commission of Canada’s Innovation to Implementation is a guide to knowledge translation in healthcare. It provides step-by-step directions and simple tips for planning knowledge mobilization. The Ontario Ministry of Agriculture, Food and Rural Affairs provides a knowledge translation and transfer guide. The National Collaborating Centre for Methods and Tools provides a registry of resources relevant to using and doing knowledge mobilization in public health. Effective Knowledge Transfer & Exchange for Nonprofit Organizations: A Framework (developed by Imagine Canada) provides questions for identifying potential outcomes of various KTE activities. Tip sheets and work sheets for research knowledge mobilizers are available from the University of Western Ontario, including this Knowledge Mobilization Workshop. The Canadian Knowledge Transfer and Exchange Community of Practice (KTECOP) is network used to share experiences and practices and build relationships between people interested in KMb. Research Impact is a Canadian KMb network hosted by York University. It helps build meaningful relationships between university researchers and community research users. The KT Clearinghouse is supported by the Canadian Institute of Health Research to be a repository of KMb resources. It is mainly oriented to researchers. Have you downloaded the knowledge mobilization plan yet? Click here to get started!